Exactly one year from Thursday New Zealand will meet Tonga in the first match of the 2011 Rugby World Cup - so this is an appropriate moment to take stock of the state of the game. The much-reviled Experimental Law Variations (ELVs) have been trialled and mostly discarded and the International Rugby Board (IRB) have re-emphasised that there will be no more changes before the tournament begins. Instead they have decided to concentrate on certain key refereeing interpretations to ensure they create a flow to the game - boding well for plenty of tries and not the wars of attrition we saw in the key contests of 2007. 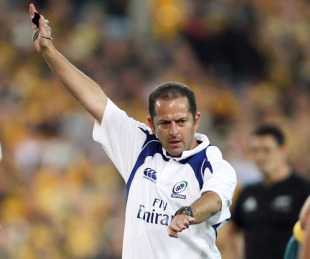 Paddy O'Brien, head of the IRB referee's board, has gone further than ever before - asking referees to be more vigilant. He has admitted that 'details' of various laws have not been refereed as well as they could be and has highlighted five areas where the interpretations will be different. The first of these is illegal obstruction at mauls; particularly lineout mauls. They tried to address it by allowing the maul to be brought down in the original ELVs but now that has been rejected O'Brien is asking that referees get stricter about how the maul is formed. Forming a barrier in front of the ball-carrier has become a normal feature of the game - denying a contest for the ball - so referees are now being asked to penalise teams if they form that barrier and move the ball back beyond reach before engaging with the opposition. Watch out for a lot more penalties in this area until teams get the message. The next area of concern is the lack of vigilance when refereeing offside from kicks. The law requires players to actually retreat if they are within 10 metres - and not to follow the kick until they have been put onside if they are outside that zone - but it has become common practice to cheat on both of these issues. O'Brien describes it as being 'lazy' and believes the receiver will have a crucial extra second to create space if officials crack down on the culprits. The idea of the 'crouch, touch, pause, engage' sequence was to prevent props going for a big hit but as Phil Keith-Roach pointed out earlier this year it has largely failed because the referees have been going through the motions rather than insisting on a real pause. Inevitably there will be more free kicks before the ball even goes in and there is a danger it will reduce the contest at the scrums. I hope not because, for me, the scrum is a cornerstone of our game. Clarification of what is and what is not allowed at the tackle should really help referees in this contentious area. It has been very much a question of playing the referee in recent seasons. Some appear to favour the tackler and others the ball carrier. That has led to a lottery on the penalty front with spectators and players often totally confused. Now the tackler must release the player even if he does stay on his feet before he tries to go for the ball. This should help clean up the mess at the breakdown and create quicker ball, which in turn should lead to more running rugby. All in all it seems a good message. For me the 2007 World Cup was disappointing because the game was moving in a direction where power and kicking ruled. Now, thank goodness the balance has been redressed and we are beginning to see the sort of attacking rugby that augurs well for 2011. The way the southern hemisphere countries have already adapted to the new regime has been very encouraging. On the opening weekend of the European season it was obvious some sides are going to take time to adapt but if they do we could be in for a classic World Cup this time next year. John Taylor is a former Wales and British & Irish Lions international and currently the managing director of London Welsh.